The National Heart, Lung, and Blood Institute (NHLBI), part of the National Institutes of Health, awarded a $4.7 million grant to Cleveland Clinic to study the prevention of life-threatening, cancer-associated blood clots. The five-year grant, led by Keith McCrae, MD, and Alok Khorana, MD, supports the creation of a new risk assessment tool to better predict which cancer patients will develop blood clots during treatment. The project, led by Cleveland Clinic's Taussig Cancer Institute and Lerner Research Institute, will coordinate a consortium of three sites involved in this NHLBI program. Other sites include Beth Israel Deaconess Medical Center (Harvard Medical School) and the University of Cincinnati. The study will incorporate data from more than 5,000 patients with colorectal, lung and pancreatic cancer enrolled in clinical trials at various research centers. Researchers will use this robust biobank to identify coagulation-related and genetic biomarkers associated with abnormal blood clotting. 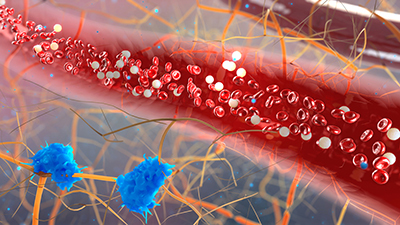 They will build on research that suggests that activation of a specific blood-clotting pathway may contribute to thrombosis, and that biomarkers related to that pathway may identify patients at particularly high risk of blood clots before they happen. The team ultimately plans to synthesize this data to develop a comprehensive risk calculator by incorporating the identified biomarkers and statistical modeling. The online risk assessment tool would be available for clinical use. The new grant builds upon important work initiated through Cleveland Clinic's Center of Excellence in Cancer Thrombosis Research, which focuses on novel approaches to the management and prevention of cancer-associated thrombosis. Since its establishment in 2016, a multidisciplinary team of researchers across Cleveland Clinic, with collaborators at Case Western Reserve University, have worked together to study the efficacy of novel therapies, develop new preclinical models, and create and expand biorepositories. Dr. Khorana's work is supported by the Sondra and Stephen Hardis Chair in Oncology Research.